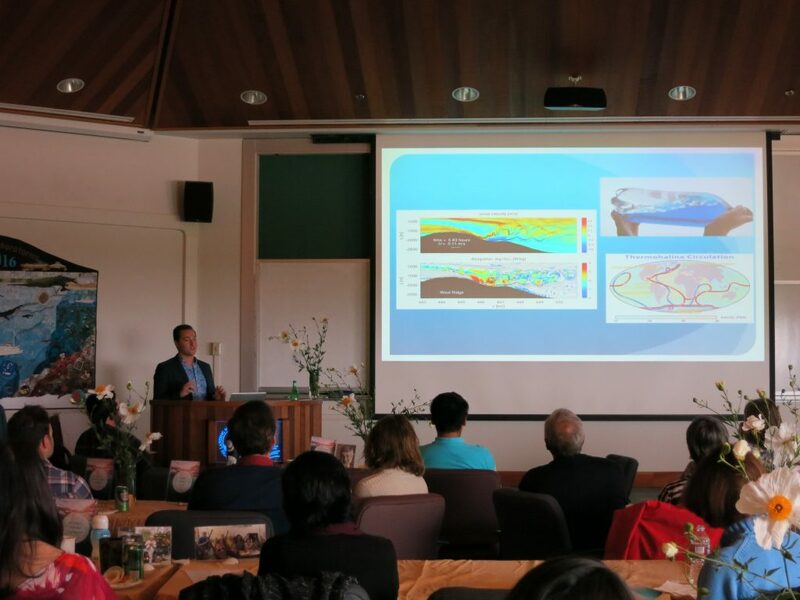 Congratulations to Ryan Manzer, recent graduate of the MLML Masters program from the Physical Oceanography lab! Ryan was one of 14 MLML students who defended their Masters thesis and graduated in 2017. Read more about the class of 2017 and their research on the Drop-In blog. 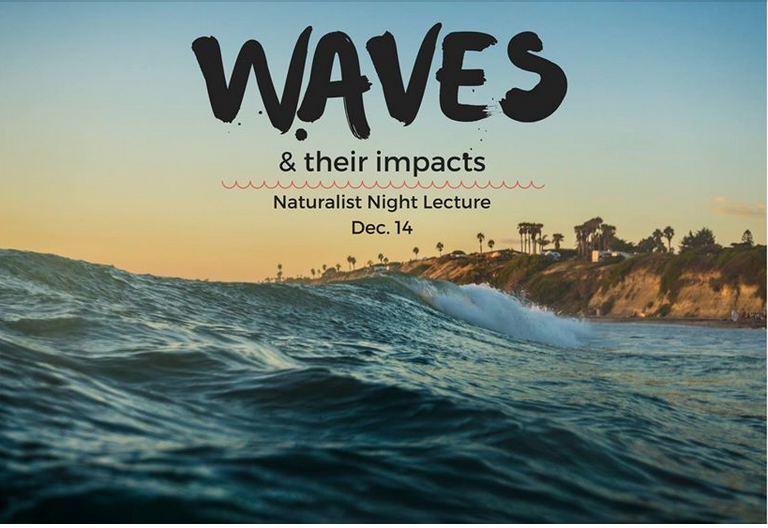 Come see MLML Physical Oceanographer Tom Connolly talk about waves at the Santa Cruz Museum of Natural History, on the evening of Thursday, December 14! 7:00-8:30pm. Doors open at 6:45pm. Ocean waves are a familiar sight on the central coast of California, carrying energy from beyond the horizon to the shoreline. However, there are even bigger waves below the surface, which help drive ocean circulation and create large fluctuations of temperature and dissolved oxygen in the Monterey submarine canyon. Other types of waves, which signal the onset of El Niño in the tropics, may be hundreds of kilometers long but less than a meter high. This presentation will discuss the many different types of waves in the ocean and how they affect marine ecosystems by transporting energy throughout the ocean. 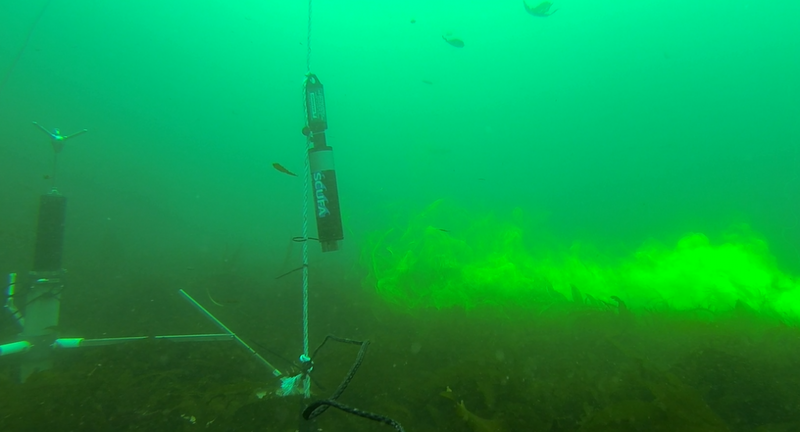 MLML Phycology student Steven Cunningham has been working with the Physical Oceanography lab to study transport and mixing in the kelp forests of Stillwater Cove. 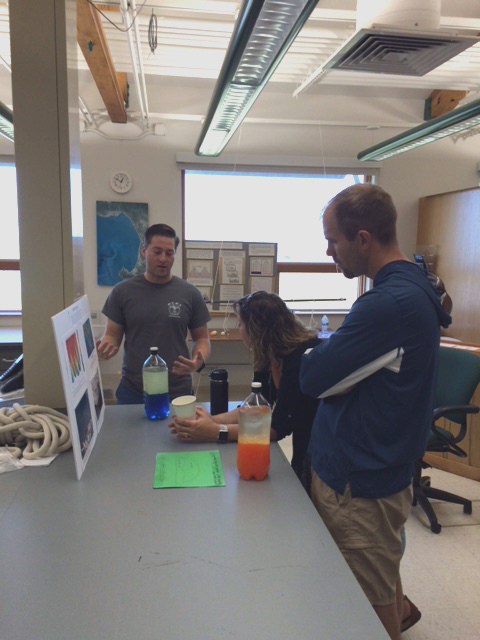 As part of his thesis on benthic particulate organic carbon in kelp forests, he has been conducting dye release experiments. An acoustic Doppler velocimeter (ADV) measures the waves and currents while a string of fluorometers measures the vertical position of the dye plume. And don’t worry, the dye is not radioactive or otherwise harmful to marine life. Kelp forests are complex in terms of both ecology and physics, and MLML has a long history of studying this system. Underwater view of a dye plume, with the ADV (left) and fluorometer (right). 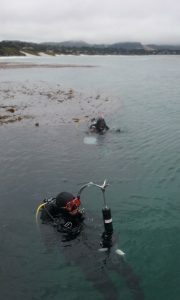 SCUBA deployment of the ADV, with Carmel beach in the background. 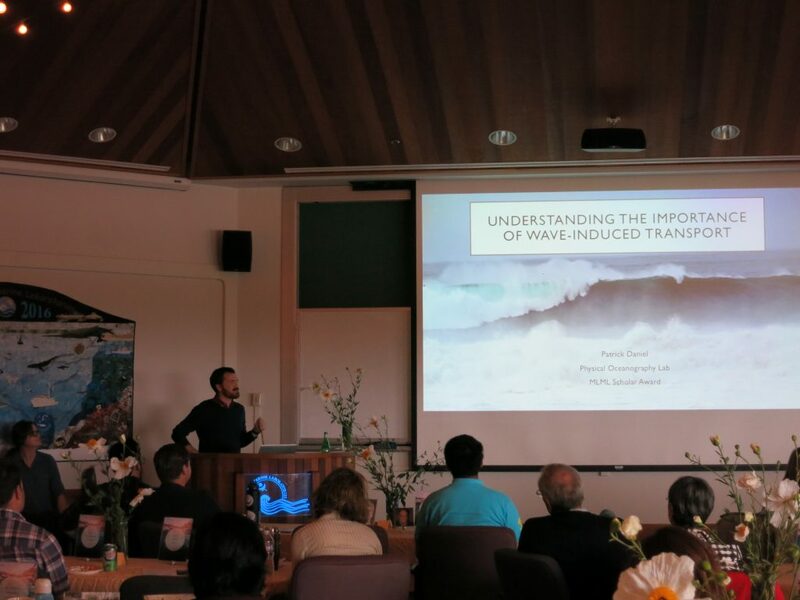 Congratulations to Physical Oceanography lab members Drew Burrier and Patrick Daniel for recent awards to support their research and graduate education! Drew was awarded the MLML Xiphias Martin scholarship for creativity in marine science and dedication to community service. Patrick was awarded the MLML Scholar Award for academic dedication and outstanding research. 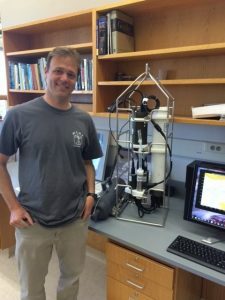 Patrick also recently received an award from the Myers Oceanographic and Marine Biology Trust to support work on nutrient fluxes in the Gulf of California, while taking part in field work with the Gilly Lab at Hopkins Marine Station. 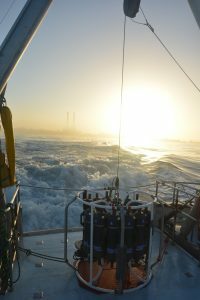 A new project in the Physical Oceanography lab, Remote forcing of seasonal currents in the California Current System, has been funded by the CSU Council on Ocean Affairs, Science and Technology (COAST) grant development program. This work will provide research opportunities for students, and help identify key locations and processes that can be targeted in future field studies. 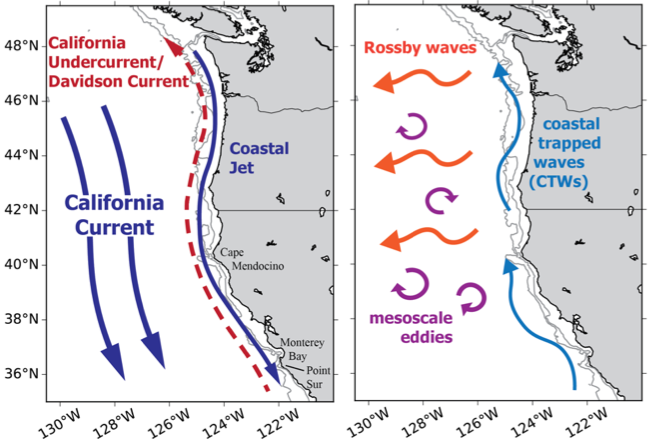 The California Current System (CCS) serves as a confluence of water masses with diverse physical and biogeochemical characteristics, representing a broad range of sources throughout the Pacific Ocean. Although a great deal of past research has been devoted to characterizing this part of the ocean, the physical mechanisms that drive seasonal currents remain elusive. For example, multiple theories have been proposed for the generation of poleward currents that flow opposite to the direction of the prevailing wind. This study investigates the theory that remote winds as far away as the equator drive seasonal variability in the CCS, both near the coast and far offshore. Large scale waves, with wavelengths of hundreds to thousands of kilometers, can transmit energy along the coast and across the ocean. The goal of this study is to conduct a synthesis of existing long-term data sets to 1) detect evidence of remote forcing at seasonal time scales in the CCS, 2) identify key sites where the remote forcing process is interrupted, and 3) create an experimental design for a focused process study in the field. Data from the multiple observational networks along the coast will be crucial for this project. 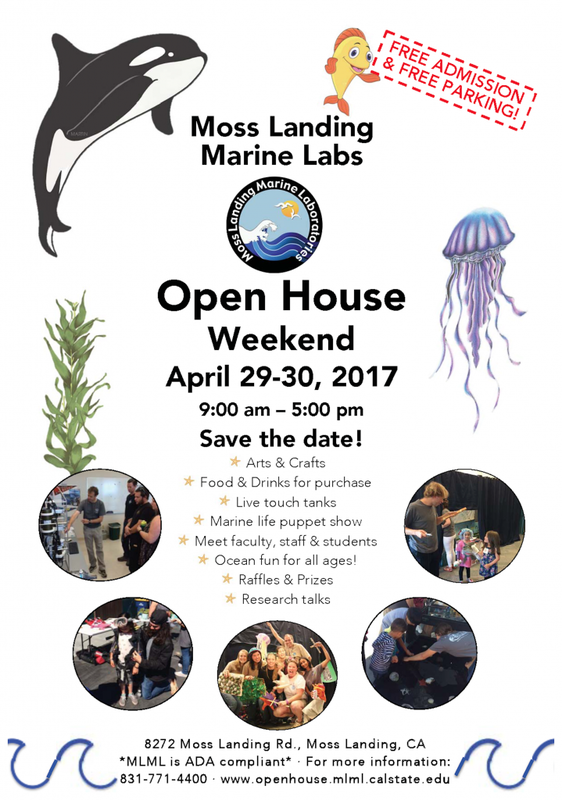 Be sure to check out the Drop-In and read about the research and outreach efforts of students from all labs at MLML! MLML will be awarding a one-time scholarship this year in memory of Bill Watson. Bill was a big part of MLML for many years. 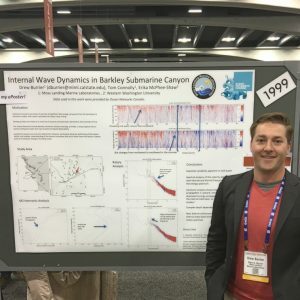 He started as a student in the Physical Oceanography lab under Dr. Broenkow, completing his thesis on tidal currents in Elkhorn Slough in 2005. He then worked at the labs in the shop and helped many students with projects, particularly with electronics and instrumentation. Bill also shared his love of music with the MLML community. 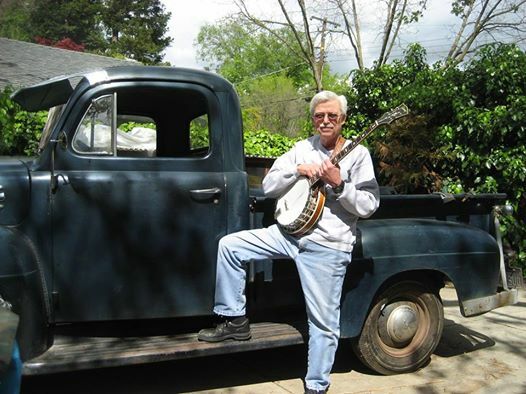 He started a bluegrass group at the lab, and started a two-year trip to handcraft 5 string banjos (see photos below). 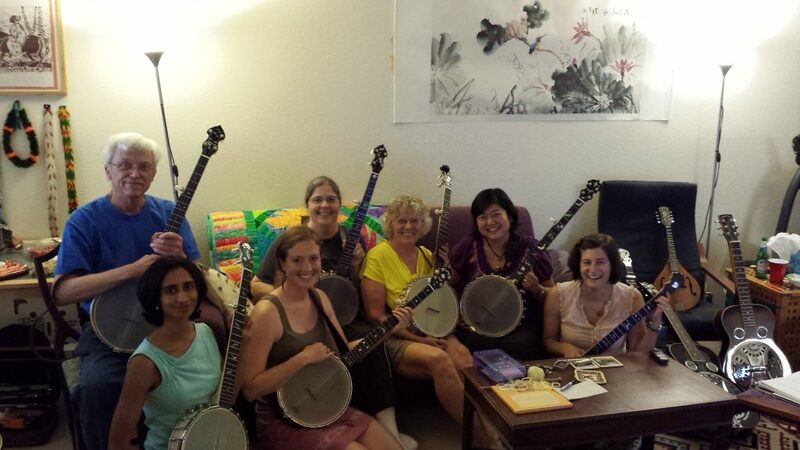 One of those banjos was raffled off to fund a $3,000 dollar student scholarship a few years back (more about this here: http://data.moby.mlml.calstate.edu/banjo9/). The Bill Watson Memorial Scholarship will be awarded this spring, at our annual scholarship reception, in the amount determined by the donations we receive. Congratulations to June Shrestha of the Ichthyology lab! 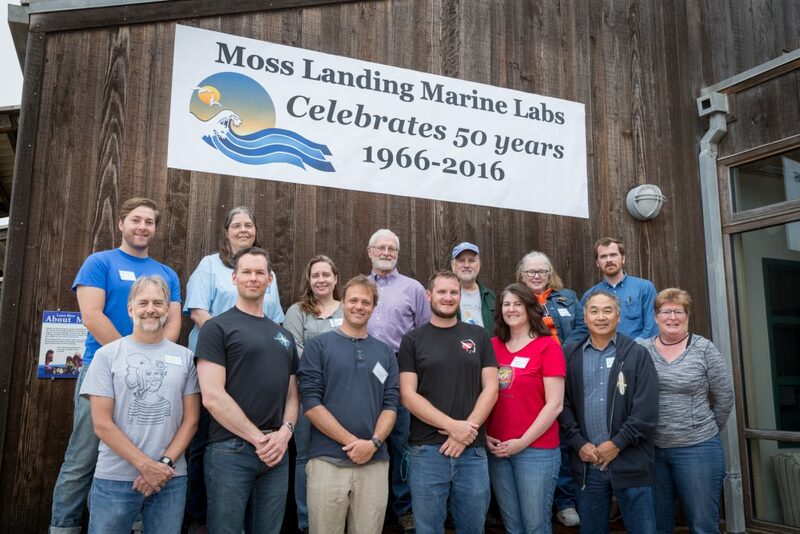 This summer, MLML celebrated its 50th anniversary. Current lab members got to meet alumni who traveled from far and wide for the big event. Many stories from the past five decades can be found on the 50th anniversary blog. Just down the road, MBARI will be hosting its 20th annual summer intern symposium on Wednesday, August 10. 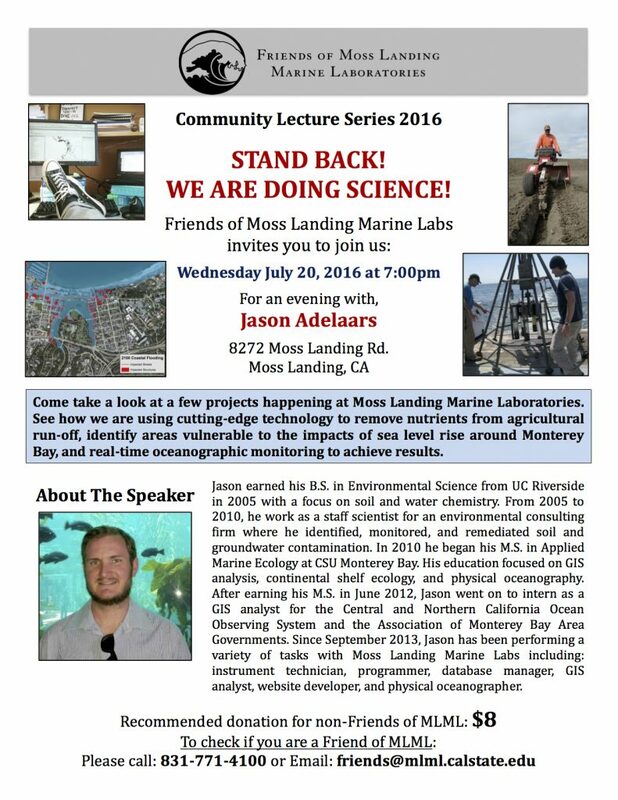 Drew Burrier, graduate student in the MLML Physical Oceanography lab, will be presenting from 11:00-11:15. The title of his talk is "Current affairs: An examination of the physical setting at Station M via the benthic rover." 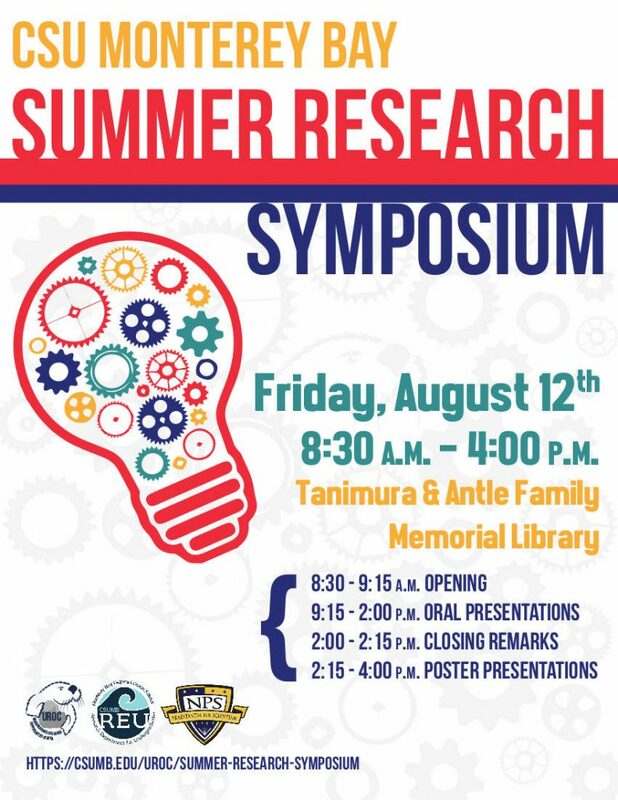 Undergraduate students doing research all around Monterey Bay will soon be presenting their work at a summer research symposium. This summer, Miranda Baker from Haverford College worked on an interdisciplinary project with the Physical and Chemical Oceanography labs. At the symposium, she will talk about her research on salinity, nutrients and dissolved oxygen in Moro Cojo Slough. 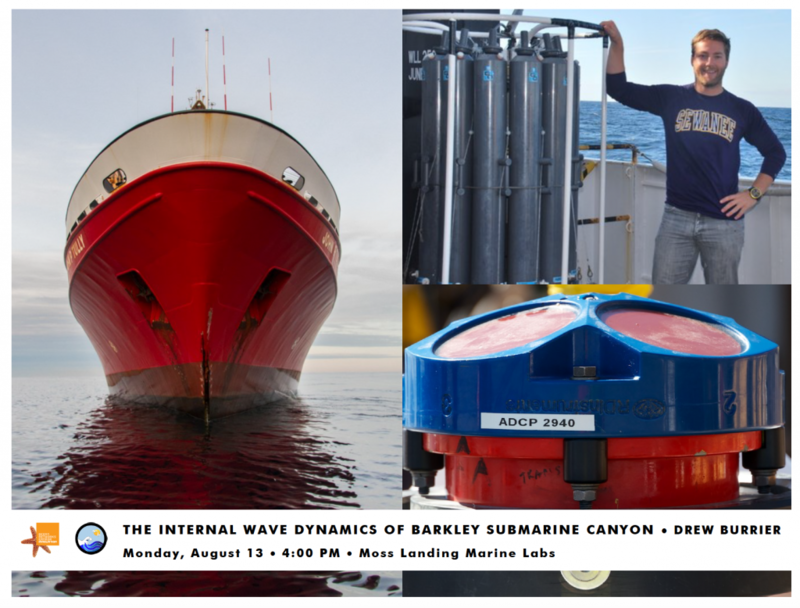 Mark your calendars for July 20, and come see an exciting evening lecture by Physical Oceanography lab member Jason Adelaars! Drew explaining internal wave dynamics. Tom at the CTD station.